Great Britain’s Royal Mint introduced its premier Gold Britannia bullion series in 1987 and followed it up 10 years later with the Silver Britannia series in 1997. Today, the Britannia coins are among the most premier names in precious metal coinage. And while the bullion edition of the Britannia has kept its same design since 2013, each year brings an exciting new design to the Britannia Proof releases – and this year is no different! With a new contemporary design by one of England's rising young artists, we're proud to bring you this 2019 Britannia Five-Ounce Silver Proof! 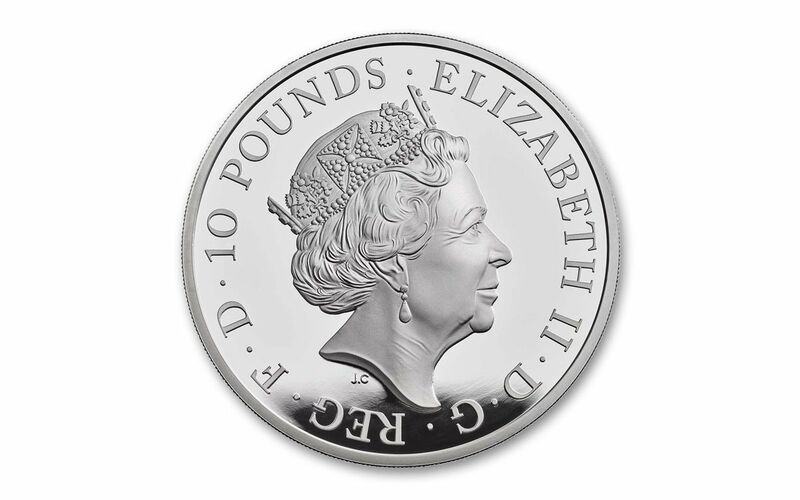 Struck in five ounces of highly-pure 99.9% silver by the artisans of the Royal Mint, this coin is £10 (ten pounds) legal tender in the United Kingdom. Your 2019 Britannia Five-Ounce Silver Proof was expertly crafted by the mint from hand-selected planchets, polished dies and multiple strikes to produce beautifully frosted details rising over mirror-like fields. It will also come in its original government packaging from the mint. 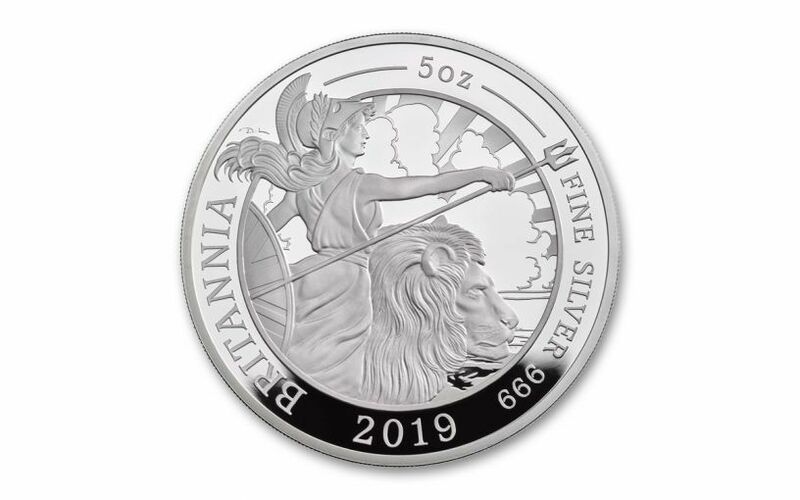 Like the others that came before it, this 2019 Britannia Five-Ounce Silver Proof both establishes and reimagines an enduring symbol of British strength. Whether you're new to the Britannia series or a longtime collector, coin fanatic or Anglophile, this vision is one worth bringing home. 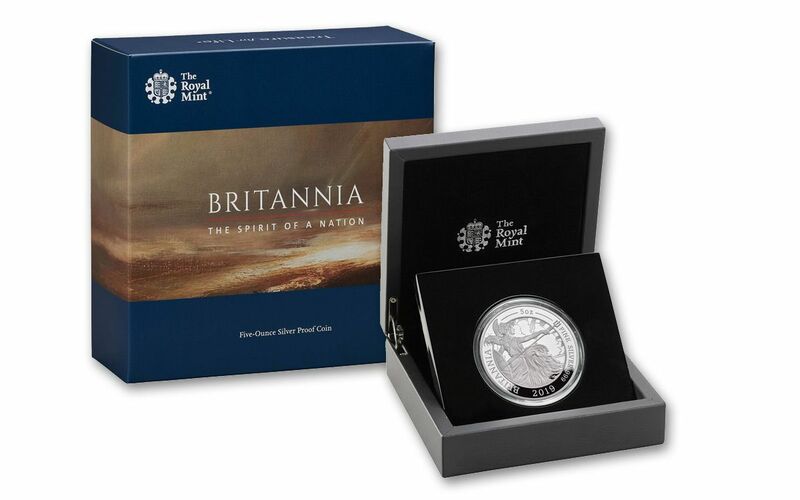 And with only 340 coins for worldwide release, you’ll need to act fast to guarantee you get your Silver Britannia Proof! Don't miss this opportunity – order yours today! EXPERTLY MINTED, HIGHLY PURE SILVER – The 2019 Britannia Five-Ounce Silver Proof is struck in five ounces of highly-pure 99.9% silver by the artisans of the Royal Mint, resulting in coins that exhibit superb details and beautiful, lustrous finishes. UK LEGAL TENDER – These 2019 Britannia Five-Ounce Silver Proofs are legal tender in the United Kingdom, with a denomination of £10 (ten pounds). GORGEOUS PROOF CONDITION – Your 2019 Britannia Five-Ounce Silver Proof was expertly crafted by the mint from hand-selected planchets, polished dies and multiple strikes to produce beautifully frosted details rising over mirror-like fields. EXTREMELY LIMITED EDITION – The British Royal Mint has limited this release to just 340.